Fertile, traditional Takeo province is largely rural and seems to have been somewhat bypassed by Cambodia’s rapid push to development. If you were going to pick any town in the kingdom in which to play a hassle-free game of badminton in the middle of a downtown street, it would certainly be Takeo’s provincial capital of Takeo. The provincial capital is actually named Daunkeo but as it is generally referred to by Khmers across the country as Takeo, we’ve gone with that. A pleasant prosperous town, Takeo is home to some fine houses, both new and French period, and lays claim to the ancient Funanese capital, now named Angkor Borei, and Phnom Chisor, an important Angkor period site, along with the well-preserved Jayarvarman VII temple of Ta Phrom at Tonle Bati. The excellent wildlife rehabilitation centre at Phnom Tamao means the province, the 20th of Cambodia’s 24 in terms of area, punches rather above its weight for the sightseeing traveller (though a number of these sights are also easily approached as day trips from Phnom Penh). Takeo lays strong claim to being the heartland of the Cambodian nation as it was central to the culture of Funan, the country’s earliest recognised civilisation from the first to sixth centuries CE. During the later Angkor period it remained an important region due to its extensive and valuable rice cultivation. The small province today lies a short distance south of the capital and has a border with Vietnam to the east. 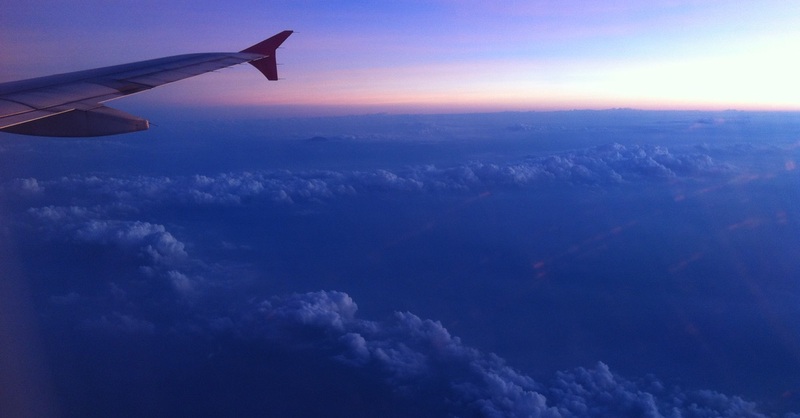 To the south is the limestone scenery of Kampot and the seaside town of Kep, while to the west you’ll find the garment factories and Kirirom Hills of Kompong Speu. It straddles the northern limit of the Mekong Delta, with low-lying land that for much of the year is under water, and the southern rim of the marginally raised but equally flat Cambodian Plateau. Over half of the land is given over to rice cultivation. The Vietnamese influence over the centuries through trade and migration is strongly felt, while the countryside is also home to Cham and Cambodia Krom villages. Takeo/Daunkeo (sometimes written Doun Keo) has literally been bypassed transport wise, as neither Highway 3 nor 4, which head south from Phnom Penh, reach the town. Even the new railway station, with services to Kampot and Sihanoukville, is situated a distance away. There are no bus services direct to here. (None whatsoever, to anywhere.) Nevertheless, the city has a good selection of accommodation and restaurants, as well as plenty of friendly inhabitants. The town’s sights won’t take you long to see, though the quiet streets in the old part of town and along the waterfront are pleasant enough for a stroll. The tiny and dilapidated market, Phsar Nat, is for a provincial capital, well… the tiniest and most dilapidated we’re seen in Cambodia. It takes at least a minute to visit. A few old French-period buildings are close by but the market action these days has shifted to Phsar Chas, around three kilometres southwest of the centre, or huge new Phsar Thmei out by the railway station. Takeo’s tourist information office (if you ever find it open) may point you in the direction of Ta Mok’s house on the far side of Roka Khnong Lake, but avoiding the 15-minute walk and using a zoom lens from a table at the lakeside night market would be our suggestion. Takeo’s most infamous son was military commander of the Khmer Rouge and also goes by the ‘The Butcher’ or ‘Brother Number 5’. His former house is reached by a concrete causeway across the lake but has these days been converted into a school so there’s really nothing to see. Takeo’s best sights are all out of town. The ancient Funanese capital, now named Angkor Borei, is located at the joining point of the delta and plateau. The area lacks the spectacular limestone outcrops found further south in Takeo but the picturesque landscape here is dotted with sandstone hills rising out of the flat rice fields, many of which house significant archaeological sites. Indeed early Chinese reports refer to the Funan rulers as the “Kings of the Mountains”, not because they inhabited a mountainous area but rather as their settlements were congregated around the low hills emerging from the watery land, many of which in rainy season become islands. Phnom Chisor, between Phnom Penh and the provincial capital, is an important Angkor-period site while Phnom Da near Angkor Borei to the east of Takeo dates back to the late Funan era. Far to the south by the Vietnamese border is another pre-Angkor site, Phnom Bayong. Takeo makes for a fine offbeat getaway from Phnom Penh or a worthwhile and convenient stop if you’re on your way down to Kampot, Kep or even Sihanoukville. Charming and quiet, you might not want to stay a week but a day or two should yield interesting results. The small provincial capital of Takeo is bordered to the north by Roka Khnong Lake and to the east by an extensive area of wetlands leading off towards Phnom Da and Angkor Borei. The latter is largely paddy during drier months but a vast lake during rainy season. The older part of town, laid out in a vague grid system, is located in the corner formed by the northern and eastern waterfront roads. The eastern one—officially Street 9, though road signs are conspicuously absent in town—is where you’ll find access to the old port, now home only to a few tourist boats for Phnom Da, as well as several restaurants and guesthouses. The northern road has a wide, tree-lined promenade and is where you’ll find the town’s popular night market. A few older French-period buildings are located around the decrepit market, Phsar Nat, in this northeast corner while newer parts of town stretch off west. The central area is very quiet but has a certain charm and also contains several good cafes and the town’s best accommodation options. You’ll also find a few basic grocery stores around the edge of the market. The Independence Monument roundabout to the northwest of the centre is the location for the main hospital and banks. From there Highway 2 leads off west to the railway station and meets busy Highway 3 at the town of Aung Ta Som. Both Highways 2 and 3, running parallel to each other, lead north to Phnom Penh while Highway 3 connects to Kampot in the opposite direction. Of the two roads, Highway 3 is in much better condition but 2 links most of the province’s main sights: Tonle Bati, Phnom Tamao and Phnom Chisor are all found just off it. There is a small tourist information office in the centre of town (Street 10, we think, diagonally opposite Delikes) with maps and some English language pamphlets though it did require four visits before we actually found it open. Officially, they are supposed to be open Monday to Saturday 07:30-11:30 and 14:00-17:00, T: (097) 278 7667, (092) 862 443.  Please sign up as a Travelfish member to download the Takeo guide PDF (8.7 MB, 33 pages). Membership costs just A$35 per year (less than A$1 per week) and gives you access to over 250 PDF guides. Last updated on 3rd February, 2017. Read up on how to get to Takeo, or book your transport online with BookMeBus. 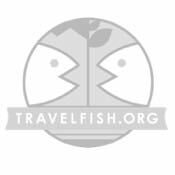 Use the above map to find specific destinations in and around Takeo which are listed on Travelfish. Bed icons indicate a guesthouse, hostel or hotel, the knife and fork is an eatery or bar and the four-way circular thingy marks sights, attractions and other points of interest. Click on any icon for a short pop-up and a direct link to the page for that spot. If you are in the area, use the teardrop icon near the top left to show your position on the map (you'll need to allow position sharing for this last feature to work).